The first time I adapted the family recipe and experimented with vegan variations was in the mid-1990s. Crumbled tofu is an obvious substitute for cottage cheese. Is vegan cottage cheese available? Maybe in the U.S., but I’ve never seen it here in Berlin. The crepes themselves may take a few attempts, as it often is with pancake things. (Indian dosas can be equally tricky!) The consistency needs to be right, and the temperature and preparation of the frying surface are important. Learning how to properly season and prep a cast-iron skillet is crucial. However, I’m sure you can get reasonable results with a non-stick pan. In case you’re wondering: In my travels I’ve looked for blintzes. I spent a few days in Russia years ago, but couldn’t find them in the few restaurants I saw. There are probably lots of mums and grannies in home kitchens still making them, but I suspect public eateries are now focusing on other stuff. I’ve seen them on menus in the Czech Republic and in Latvia. In Poland, I saw variations of blintzes (and pierogi!) quite often, especially in the freezer section of the grocery store. They go by different names (like Blini) in different regions. Despite all the blintz-spotting during travels, I don’t think I’ve ever had blintzes in a restaurant. They’re a nostalgic, home-cooked kind of thing for me. Mix flour, chickpea flour, cornstarch, salt in a large mixing bowl. Mix soy milk and water in another bowl. Gradually add wet ingredients to dry ingredients and mix well until smooth. Let batter sit for 1 hour. Heat a frying pan, preferably a well-seasoned cast iron pan on medium to medium high heat. Put a few drops of oil on the pan and rub it around with a paper towel. Cooking spray can also be used. Do this before each blintz. When a drop of water sizzles and dances on the surface, the pan is ready. Pour enough batter onto hot pan for one crepe. Cook 3-4 min, flip carefully with spatula and cook 1-2 min on other side. Transfer to a plate, continue for all crepes. Combine tofu, crackers, nutritional yeast, salt, lemon juice in a bowl. Spoon 2-3 large spoonfuls of filling into the middle of a crepe, fold over sides and roll bottom and top of the blintz over to close, like a burrito. Place assembled blintzes on a pan on low-medium heat with a cover and heat for 5-6 min, turning carefully every 2-3 min. Serve with soy sour cream or soy yogurt and cherry or blueberry jam! Nuttier: Substitute ground sunflower seeds or other nuts for crackers in filling. Other fillings: Experiment with cooked apples, fried potatoes, sauteed vegetables, etc. Herbs: Add thyme, Herbes de Provence, or other seasonings to tofu filling if desired. No nutritional yeast: Easily omitted. 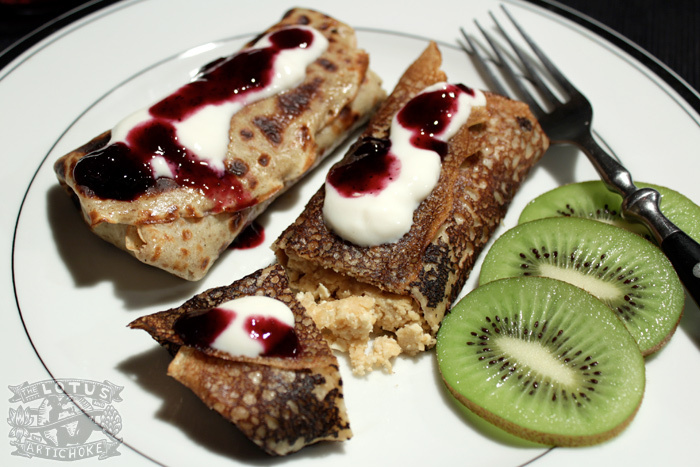 This entry was posted in Russian and tagged blintzes, recipe, Russian, tofu, Ukrainian, vegan. Bookmark the permalink.